It is last, but the core strength of Advatech Healthcare. 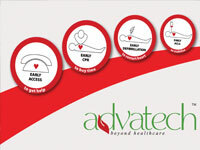 Advatech Healthcare is closely working with some of the World Class universities and training services providers in the UK to have an expert training team who will provide all types of First Aid, fire & safety, CPR, Occupational Health Hazard training to corporate. Now a day’s giving basic safety training to their employee becomes mandatory for every employer. Advatech got a firm footprint in this sector in the UK. We are also expert to conduct the pre-employment health checkup, the routine health checkup by our dedicated team at the corporate locations to SAVE the man hours productivities.